It’s the last day of September on the crookedshore and the weather reminds me that winter is coming. The wind is strong and though it is at my back on the outward journey, each time I turn to see where the dog is the brim of my hat is lifted and I have to shove it down further on my head. And the cargo ships anchored out in the lough hunch their shoulders and face into the wind in an effort to ride out the wait before they dock in Belfast or Carrickfergus. The rain is here too and the clouds are low. This morning not only can I not see the hills on the far Antrim side I can barely make out the houses that line Ballyholme Bay. All around me things are closing in and closing down. The clouds twist and turn overhead, driven where they may not want to go by the big wind, crashing into hills and homes . The few walkers that remain are here out of duty to exercise their pets. And their faces betray them, at least the part of their faces that I can see behind hats and scarves. Chins are buried deep into chests as they bend into the wind and look forward to getting home. I, on the other hand, am delighted to be out and a thrill of enjoyment passes through my body. I’m dressed appropriately, a red waterproof and windproof coat with a zipped-in grey fleece keeps me toasty. My familiar, well beaten boots keep my feet dry and my footing secure. And my weather worn hat keeps my old head dry. This morning I have brought a radio with me which brings BBC World Service to my ears along the crookedshore. Journalists and broadcasters vie to outdo one another with prophecies of doom. 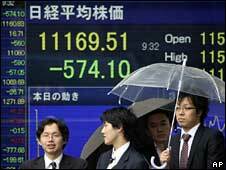 Reports come in from markets all over the world as the financial tempest is tracked. The Dow is blown off course and closes after it’s biggest fall ever. The FTSE opens 3 per cent down already. Russia has closed. The Hang Seng, the Nikkei, markets in Sydney, Mumbai and all over Europe, down, down, down. Swept away in a downpour of their own making. But I notice that the familiar signs of autumn are all around me. Still more blackberries emerge on the brambles, free to all, unbidden and abundant. The leaves are finally changing colour and falling to carpet the ground in glorious reds and yellows and browns. The seasons turn and turn as they always do. The world won’t end today, though it should change. « Best Marriage of Storyline and Backing Track Ever?